The Board of the Annapolis Valley Regional Library (AVRL) is pleased to announce the appointment of the new Chief Executive Officer, Ann-Marie Mathieu. Ann-Marie began her new role on Monday, August 10, 2015. Ann-Marie has considerable experience in all aspects of library administration, gained from her fifteen years as a library director in various library systems. Most recently she has served as the Deputy Library Director of the Saskatoon Public Library. Ann-Marie has a vision for Library service that is founded in the firm belief that the public library is a community development agency, and that the library is an important piece of the puzzle in building strong, vibrant, and healthy communities. 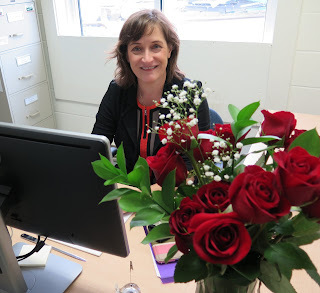 On Ann-Marie’s first day she was greeted with a bouquet of roses from the staff. There was even a pot-luck lunch so Ann-Marie was introduced to the staff at the AVRL Headquarters in fine style. We are all looking forward to seeing what Ann-Marie has in store for AVRL, and we welcome her wholeheartedly. You will see a new face representing our libraries. Say hello when you see her!